This page contains all the software I have written. Most of the programs were needed as I could not find a free version elsewhere that I could use. All software here is Copyright (C) 2001-2008 Neil Wightman. The software is provided 'as-is', without any express or implied warranty. In no event will the authors be held liable for any damages arising from the use of this software. 2. Any notices may not be removed or altered from any distribution. Overnet Joiner tries to take *.part files and make a usable joined file. This will normally only work on files which can tolerate missing bits. Like AVI or MPG files. The first part (1.1.part) must have the header information for the files to be playable. If part 1.1 is missing Overnet Joiner will not work. Sometimes it best to use VirtualDub or TMPGenc to repair the files to remove any unplayable sections. Also you will probably get a smaller end file that will play the same as the original. Please note that Overnet Joiner minimises to the System Tray. Overnet Joiner has been tested with Overnet version 0.53 and eDonkey2000 v1.0 only! Dont forget to backup your .part files before using this program. Download OvernetJoiner.exe (124Kb) and simply run it. 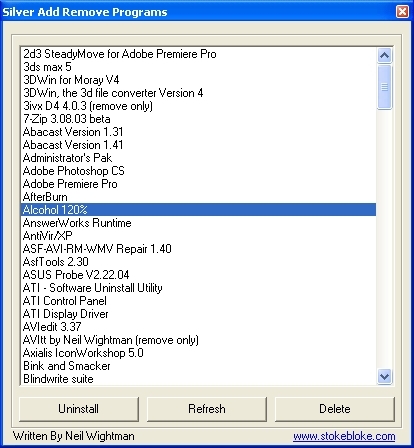 An Ultra quick and lightweight replacement for the Windows Add and Remove Programs. Written in C#, Silver Add Remove Programs is quicker than the standard Windows Add and Remove Programs as it does not calculate disk size or last used times. Most of the time this information is not needed. Uninstall laucher was totally rewriten to cope with special MSI uninstall programs not launching. This version contains a small patch to fix some uninstall entries which would not launch in Version 1.0. First release. Its great, it works and its a load quicker than the normal Windows Add Remove Programs. Download SilverAddRemove-1.2.exe (65Kb) and install. AVItt allows useful information about known filetypes to be show in the tooltip for files. Currently it knows about AVI files and will show the length, size, video codec, fps, audio codec, bits per second. It also displays a few lines from .log, .bat, .txt files. You cannot have one without the other at the moment. This is the first release, it is stable with all AVIs I have but if you have a problem, either email me. Download AVItt.exe (53Kb) and install. Below are two screen shots of it in operation. Issue found while the AVI tool tip is being calculated it locks the file. This means you must wait for the tooltip to be processed before pressing delete or moving the file, else it will fail and inform you the file is in use. Firstly this was not written by me but by Glenn Carr. All I did was build it and create a nice installer for it. CopyShell is a context menu that allows you to copy the full path to the file you have selected into the clipboard. CodeGuru.com original site. This has the source code and VC6 project. Please see the original article for more copyright information. FuDoop is a totally free to use program, which can find duplicate files. It allows the user to see all the files that are duplicates for the user to delete them. There is no automation, as this can cause unwanted files to be removed. Version 1.5 now has improved usablity when navigating and deleting files using the keyboard. It also has improvements for the finding of duplicate files, which can dramatically improve the performance when comparing large files. Informative tooltips allow the user to see more information about the files before they are deleted. The tool tips also support previewing images. Finds all duplicate files in a selected directory. Sort by file name, file extension or by the number of duplicate files found. Search for files which match a sub-string, then only showing the files which match the criteria. You can download the installer which contains FuDoop and java from here FuDoop download 12 Mb. NClip is a small utility that allows other command line tools to interact with the Windows clipboard. This tool allows you to find the working directory for batch files. It should work on any Windows OS. I have checked it on Win98, Win NT and Windows 2000. The hard work is done by the pwd.exe. In my example I redirect the output to another batch file then run this, created, batch file which leaves the variables it sets available later on. This pwd.exe also defaults to showing the short path for the current directory, this is something that I have needed alot. The pwd.exe takes a -l parameter to define that the path should be long version, if this is not specified then it defaults to showing the short pathname. The -a or -b can be used to specify string that should be output after or before the pwd string. The -n allows a newline to be appended to the pwd, by default a new line is not added. This windows on top command line program allows any Window to be made 'Always on top'. Note This is now obsolete as Java 1.5 comes with this functionality as standard. This is a dll and jar that allows any java.awt.Window to be set as 'Always On Top'. You need to ensure that the WindowOnTop.jar is in your CLASSPATH, and that the WindowOnTop.dll is in your PATH. Below is a quick example. I really didnt write this, I downloaded the source code and compiled it, but I can no longer find it so I provided my copy. If anyone knows where this originally came from please tell me. Note this does not work with Java 1.4.x and Java 1.5 now has this functionality built in. This windows transparency command line program users to set the transparency of a window. This only supports Windows 2000 and Windows XP.